Home » Articles » Men's health » Who’s cooking tonight? Without being sexist who cooks in your house? 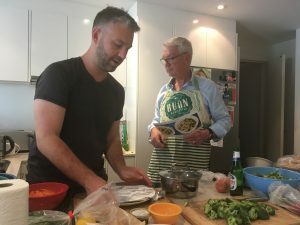 Although celebrity chefs on TV are mostly male and 60% of NZ chefs associations >900 members are male,1 when it comes to the home kitchen men are poorly represented. Just over half the women who had a partner and did most of the cooking would like their partner to shoulder more of the load and cooking was considered an appealing quality in a partner by 89 per cent of the women surveyed. While women still undertake most of the cooking burden around the world changes in chore division in the home are occurring. Also the time spent cooking had dropped for women from 113mins in 1965 to 71mins/day while for men, time spent cooking increased from 37 to 49 minutes/day. These researchers postulated that the use of kitchen equipment and opportunity to place photos of their cooking efforts on Instagram probably contributed to mens more positive experience. Why does it matter who cooks? Traditionally men worked away from home and hunted and women raised children and cooked. Family recipes and cooking skills were passed down each generation. This is still the case in many countries around the world. However as more women work outside the home, families become more fragmented and traditions change, cooking skills are being lost by both men and women and this social change is influencing our health and education. • technological advancements (e.g. microwaves for heating ready cooked meals). For people to make good food choices and to take control over their health they need cooking literacy and as the food environment changes this becomes more important. While people may want to feed their families well, a lack of cooking literacy has been found to lead to a higher reliance on eating out, fast food restaurants and ready-made meals. • Mechanical skills: measuring, weighing, mixing, peeling, grating, cutting, mashing, kneading, rolling etc. • Knowledge of when to apply these cooking skills and being able to adapt meal components to create healthier variations. This comes with time, practice and confidence. Although families lead busy lifestyles these days, encouraging parents to prepare healthy food in the home (most of the time) can benefit the educational outcomes and health of their children. At a National level these things can help to reduce food waste, improve the quality of life, reduce food costs, increase productivity and reduces the strain on the health system. Improving our diet and health is not just dependent on parents but also changes within the school curriculum to ensure that cooking skills being taught align with healthy eating guidelines.10 Also that government legislature helps to create an environment where it is easy for us all to make healthy food choices and gain regular exercise. • Plan meals together and shop with a list. If time poor, buy food online and remember to also plan for healthy breakfasts and lunches too. • Men enjoy cooking meat, so encourage them to prepare food for barbeques, but keep meat portions small, limit processed meats (bacon, sausages and ham ) and add more fish and vegetables. • People who are flatting or those wanting to try new foods might like to try buying in meals where the ingredients and recipes are provided such as Marley Spoon® or My Food Bag®. Having all the foods supplied and delivered (including spices/oils etc) with glossy recipe sheets make cooking easy and fun. • Every so often cook extras and freeze leftovers so that rather than buying takeaway you do have meals on hand to heat and eat if you are running late home from work. • Couples may enjoy sharing the cooking or taking turns on different nights. • If you have children take the time to involve them from a young age in undertaking some of the cooking chores such as setting tables, making salads, helping to put away groceries and doing dishes. • Spread the load of cooking by encouraging everyone to develop their own signature dish and make this (or variations of it) regularly. • Men are competitive. Sharing their cooking achievements on Facebook and Instagram encourages other men to try cooking too. If you require assistance with weight or other health issues then contact us today. Why are NZ men getting fatter, faster than women? 6. Hill L, Casswell S, Maskill C, Jones S, Wyllie A. Fruit and Vegetables as Adolescent Food Choices in New Zealand. Health Promotion International. 1998;13(1):55-65. 7. Heinz Wattie’s Limited. The Project Cook Report: the state of kids’ cooking – can our kids only txt for take- out? Available from: http:// www.watties.co.nz/content/ download/1275/13209/file/ projectcook.pdf. Accessed 10 May 20162005. 8. Weight Watchers. Plate of the Nation. Available from: https://www.weightwatchers. com/nz/sites/nz/files/ bug_142737_Plate_of_our_ nation_Release.pdf; 2012. 14. van der Horst K, Brunner TA, Siegrist M. Ready-meal consumption: associations with weight status and cooking skills. Public Health Nutrition. 2011;14(02):239- 245. Next Could you make healthier decisions when shopping?